Want to live the American dream of entrepreneurship? Well, eventually you’re going to have to quit your job. There are right and wrong ways to make that initial stride and ensure success following resignation. 1. Cultivate an entrepreneurial mentality. You must have a true desire to become a successful entrepreneur or you won’t make it. Don’t kid yourself – entrepreneurship is tougher than being an employee and thus, you must become tougher both mentally and, to an extent, physically, as long hours can hurt your health and stress can be a killer. If you’re quitting your job to become an entrepreneur, your mentality must be stubborn. Once you become an entrepreneur, looking back on the good ‘ol days when you had a paycheck becomes counterproductive. Whatever is in the past must be left in the past, because you now have control over your future success – or failure. An entrepreneur must be willing to do what it takes to succeed, whether it be grueling hours or eating pasta for months on end to save money. You have to learn to become self-reliant and need to be fully prepared to do so. Remember, leadership comes from within. If you’re looking around for people to tell you which business to open, then you should remain an employee, as you are not ready yet. Entrepreneurs don’t crave direction from others; rather, they rely on their instincts and take calculated risks. Sometimes, entrepreneurs wish they had a boss, as being told what to do is a lot easier than figuring it out yourself. When choosing your first business model, be realistic about your competition. Don’t compete with the best and brightest in the world; that’s not logical thinking. Pick a field that pays well and has competition, but not in the overwhelming sense, and make sure that you enjoy the field and find it personally fulfilling. At the same time, don’t overthink this part: it’s half gut, half intellect. Rely too heavily on one or the other and you won’t do well. 3. Save on expenses at every turn. For many aspiring entrepreneurs, the thought of having to learn all aspects of running a business prompts them to run to expensive vendors that produce little and charge a lot. As I stressed above, your self-reliance will prove to be your best friend – or your worst enemy. Saving money means having to learn things that you never wanted to learn (and never thought you would have to). For instance, when I started my recruiting firm, I thought that I would never have to learn how to program – but I did. At the beginning, unless you have a lot of startup capital, wearing many hats is key. 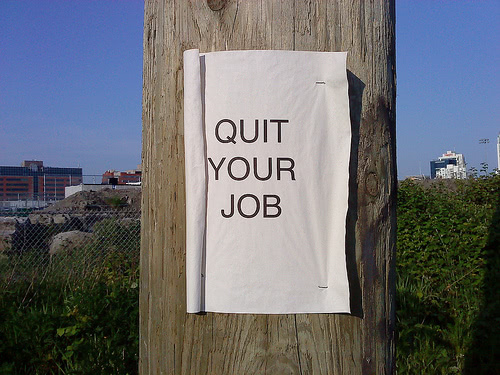 Also, know how much money you want to make prior to quitting your job. The best companies have fiscal goals that are clear-cut. Your approach should be no different. Once you have that number, relentlessly pursue it (but put aside cash in the interim to cover your living expenses). 4. Start building the business for success while you’re still working. Many entrepreneurs just quit their job only to learn that their predictions about the business they were going to open were wrong. They find themselves unemployed and often depressed about their failure. Going from 0 to 60 is not recommended. Before you go pro, try it out by spending your free time opening your company. Not only should this tell you whether or not you would like to be an entrepreneur, it will also tell you if the business you’re opening has potential – or whether you should look into other options. Quitting your job to open a business is a big thing, and big decisions should not be made on the fly. Upon becoming an entrepreneur, you must have a positive attitude about being successful. When we are overly negative, it hurts our performance, and pessimistic behavior also drains energy. Plus, if you don’t think you can do something, you are not going to work as hard as you possibly could on the task. In fact, in my experience, the anticipation of failure is the main reason something doesn’t work out – not a lack of natural talent or intelligence. Finally, being an entrepreneur is competitive. There are other firms that will not like you doing business in their space once you become successful. People will always want to take your head out of the game. Always keeping a healthy attitude gives you a much better chance for survival. Ken Sundheim is the CEO of KAS Placement Executive Search a New York City staffing firm that Ken started in 2005.